Robot Dreams – "Last night I dreamed," said LVX-1, calmly. "Last night I dreamed," said LVX-1, calmly. This is a short report on my experience from attending the WG21 2018 San Diego meeting. Some warnings though..
I’m a very infrequent WG21 in-person attendee. The last time I attended was in Chicago 2013, and that was for one day. This time I managed to attend for three days. My main goal for going this time was to present for discussion P1177 and P1178. Both proposals for SG15, or so I thought when I first wrote them. But as we all know.. Plans are obsolete the moment they are conceived. My feeling towards the worth of attending are mixed, more on that below. I say that, from the context that I attend these things by taking vacation and paying for my own way (I do have to thank my employer, Disbelief LLC, for paying one work day). The only order below is relative to what I feel is least to most important to me personally. I hope you will read to the end (or if you are impatient just skip there). Most Valuable Resource Award goes to: ACTIVISTS! Here we are in a new year, with a new US Congress and new US President. And with a majority of the US population rather unhappy about that new government. Which makes for a whole gaggle of activists spending their time and money to attempt to change the situation we are in. Upwards of 3.5 million of them around the US demonstrated in the name of equal rights on Saturday the 21st of January 2017. Including the 250 thousand I, and my 7 year old daughter, and my rather overworked wife, that marched in Chicago even though they where told the march was canceled. 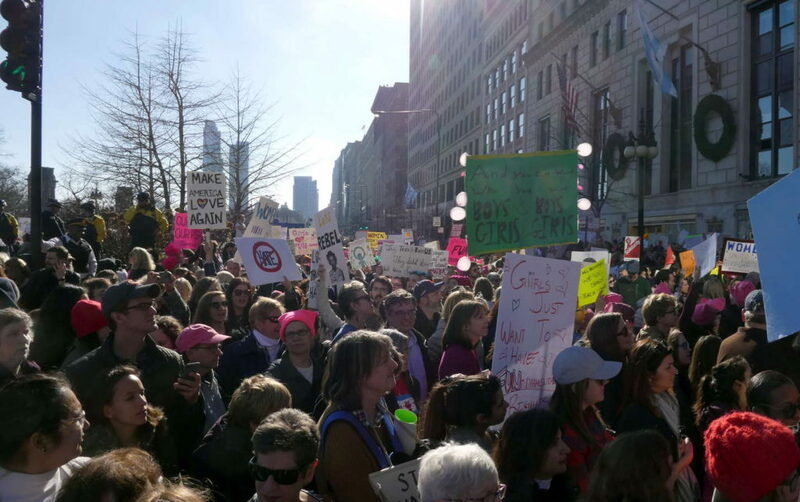 Walking along with 250,000 activists at the Women’s March Chicago 2017-01-21. Don’t waste your time and money! I’m not saying don’t volunteer or donate. Just don’t throw that valuable resource away towards inefficient, fruitless, or opaque efforts. What do I mean by that? Simple, when someone asks you to volunteer time, or give money, ask “What for and why?” Find out how your resources are going to be used. And evaluate if that’s a good use of your time and money. Easy right? Well, some times it’s easy, and some times it’s hard, to do that evaluation. Heck, some times it’s almost impossible to get enough information to even begin to consider the question. But knowing the answer to how your resources are going to be used is the key way you can exercise the vast power you have to shape the world, especially the political world. What does asking “What for and why?” look like? Here are two personal examples to show you what that looks like for me.. It has been an eventful few days, highlighting the challenges we face, and the energy and passion with which people are ready to respond. Amid it all, I wanted to make sure you didn’t miss news of the ACLU’s first legal action of the Trump era. And it goes on to ask me for money. I can also go to the ACLU web site, and read the varied ways they plan to use the money they are asking me to give them. I can clearly see what effect my money will have on advancing the values I believe in. And clearly, I give them money. Today, Donald Trump takes the oath of office and becomes our next president. The hateful, dangerous rhetoric we saw throughout Trump’s campaign? It will now live on in the White House. And so many people across this country are worried what this means for their future. I hope you are ready to fight back. I certainly am. That’s why we launched our 2017 Action Fund. Please, help our organizers defend our Democratic values by chipping in $15 or more. I’m proud to stand with progressives across this great country to hold the line defending our principles. Many of us are boycotting today’s inauguration and marching in cities across the country to stand against the Republican rollback of American progress. But it doesn’t stop there. We will be organizing—daily—making sure America’s most vulnerable will not have to fear for their safety, their families, their health, or their livelihoods. Your support of our 2017 Action Fund can help us keep the fight alive. Rene, please consider chipping in $15 to defend American progress. Forming an “Action Fund” is an interesting development. What concrete actions are you planning on doing with the proceeds of the fund? Is there a specific organization, or PAC that is receiving the funds? Where can I find out more about this? What concrete actions are you planning on doing with the proceeds of the fund? Is there a specific organization, or PAC that is receiving the funds? Where can I find out more about this? Sorry for the confusion. It is for Schakowsky for Congress. Our internet folks named it that, but it not a separate fund. The funds of Schakowsky for Congress will be put to use with lots of action items. Jan’s campaign seems to respect volunteers enough to respond to their questions. Kudos to them. The “Action Fund” is a lie, err I mean alternative fact. I have no way at this time to answer the important question as to “what for and why”. I am well aware how campaigns work and how the money is handled to realize that there is little chance that money I give to the “Schakowsky for Congress” is going to be used for anything but for Jan’s, or another politician’s, election efforts. I conclude that I should wait and look for other ways to expend my activist resources. I start considering that it’s a rather good idea to start a real independent “Action Fund” to help carry out concrete actions. Yes it does indeed help. Thank you for the honest and direct clarification. I look forward to hearing in the future what concrete actions Jan will be taking with her campaign. But until I hear what those action items are and hence can ascertain how my hard earned money is going to be used I will refrain from contributing. Hopefully as a budding activist, or an experienced one, you can learn how important it is to wisely spend your activist resources. More than a year ago I was laid off. Which happens to be a rather common occurrence in the game development field. Like many people in that situation I went into a frantic “search for new job” mode. I was lucky to land a new job at Phosphor Games. Which proved to me how outstanding the Chicago game development industry is. I’ll be starting a new job in April helping out CodeBeast get their Chicago office off the ground. I’m excited to tackle this challenge. Saying that I’m certain everything will work out would be highly out of my character.. But I can say there will be many fun challenges to work out in my future. What now feels like ages ago, during a time of high stress, I started writing a diary. Not entirely a diary about myself.. But a diary about my observations of my then two year old daughter. It was therapy against the stress and trying times. If I could find something that made me happy each day and write it down it would “reset” my mind and help me move away from the stressful events. It eventually because something else. It became a way for me to capture and remember what I couldn’t from the hundreds of photographs I normally take of life around me. Eventually that part of my stress went away. But another came, and thankfully also passed. Now that life looks as bright as it has ever been I’m taking up the diary again. What follows will be a multipart recounting of the once only Facebook diary entries. They will both be re-edited to correct obvious language mistakes and will sometimes contain some more explanation (if I remember). After the retelling I will resume the diary as best as I can. A short time ago, in the Twitter space, a local game developer complained about a game development scheduling conflict. Which prompted from a second game developer the wish for a comprehensive event calendar. For which my immediate thought was “that’s something some programming can solve”. And hence I started working up a quick Python script to merge a bunch of calendars into one. And like the best programmers I stole a bunch of code someone else had written and edited for my use! If you have a calendar you think would be good to add to the above list please contact me here on on Twitter. Note, the calendar must be publicly accessible and in iCalendar format. Oh lovely spring in Chicago area.. wherein we get the new experience of snow ball hail. #cplusplus is to English, as #rustlang is to Esperanto. Content is copyright by the respective authors.